I always been a fan of Grimlock. I could never buy him as a kid. His Action Figure was hard to find and really expensive. Even when you try to find the G1 Grimlock his price has tripled and some sellers have him in not very good condition. I'm glad to get the Toys R us Masterpiece. The only thing that really gets me pissed was the packaging was damage when I bought him. I'm usually a mint in box collector(MIB). Weakness offends Grimlock. He considers none so weak as those who refuse to use their full strength to command victories. As a result, he’s never had much respect for Optimus Prime. He barely even considers himself and his Dinobots to be part of the Autobot army most of the time. He only grudgingly helps the heroic Autobots because the tyranny of Megatron offends him even more than weakness. He longs for the day when Optimus Prime makes a final mistake, leaving a vacancy that Grimlock will be more than happy to fill. 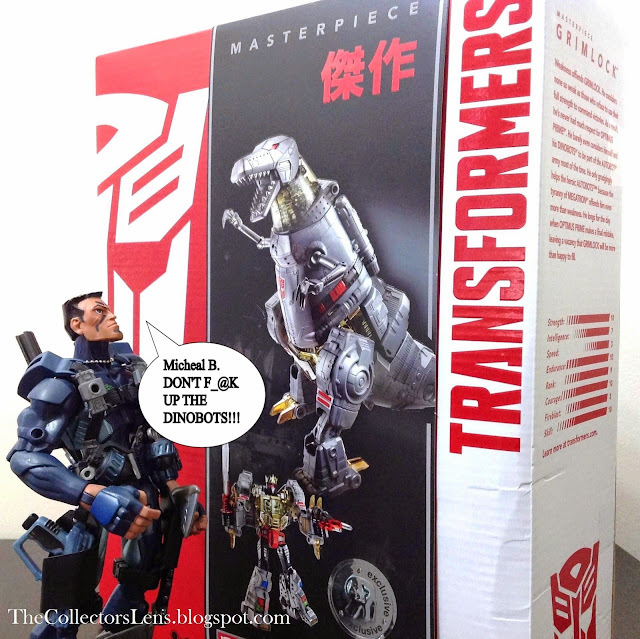 This is one Dinobot who can’t wait to mix it up with his Decepticon enemies! Your Grimlock figure is a powerful Dinobot that comes armed with a double-barreled blaster and a sword that glows in battle! Can he wrest the crown of leadership from Optimus Prime? He converts from Dinobot mode to raging dino mode, and his eyes change color in the heat of battle! Keep converting him from Dinobot to dino mode and back so he can handle whatever his enemies dish out! This awesome Masterpiece figure features incredible attention to detail, and closely resembles the look of the original Grimlock Transformers figure. This amazing figure also comes with a double barrelled blaster, glowing sword and the Dinobot Crown of Leadership. When in dino mode, his eyes light up in the heat of the battle! The leader of the Dinobots, a small but powerful strike squad. Grimlock himself is extremely strong and durable, and is one of the few Transformers who can not only stand toe-to-toe with Optimus Prime and Megatron, but actually give them a run for their money. Despite his strength and prowess, Grimlock continually struggles with his pronouns. When Optimus fell in battle during a massive Decepticon attack on Autobot City, Grimlock took command of the Autobot forces and led them to victory over the enemy forces.Grimlock also came to the aid of Rodimus and Sergeant Kup when the pair were put on trial by the Quintessons. He persuaded the Sharkticons to turn on their masters, saving the day.